Whether you shop online or in-store, you’ll get the most from your everyday shopping with the Usdaw Prepaid Plus Cashback card. You’ll earn between 2.5% and 6% cashback at over 50 major retailers°. Plus, the cashback is unlimited, so there’s no minimum or maximum spend requirement nor any restriction on how much cashback you can earn. To apply for your card, click ‘Get my card!’ then complete the short form (you’ll need your Usdaw membership number to hand). Then, make a top up and you’ll receive your card within 14 working days. 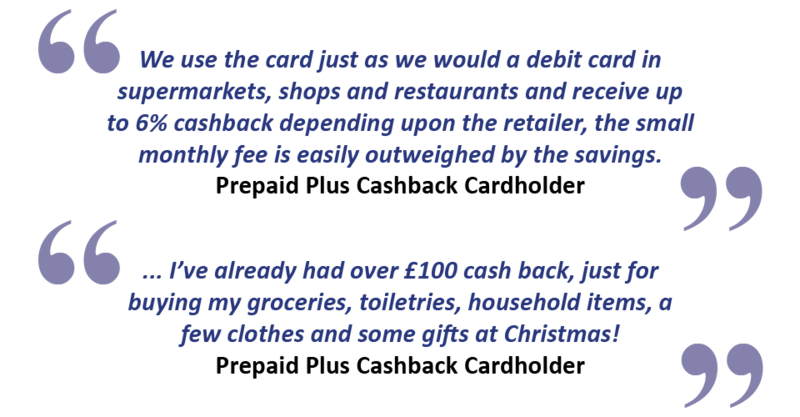 °Range of brands, levels of discounts and cashback are subject to change. * There are no credit checks, but as part of the application process we may use you details to confirm your identity. There is a monthly fee of £2.95. The first fee will be charged within 30 days of successful application. 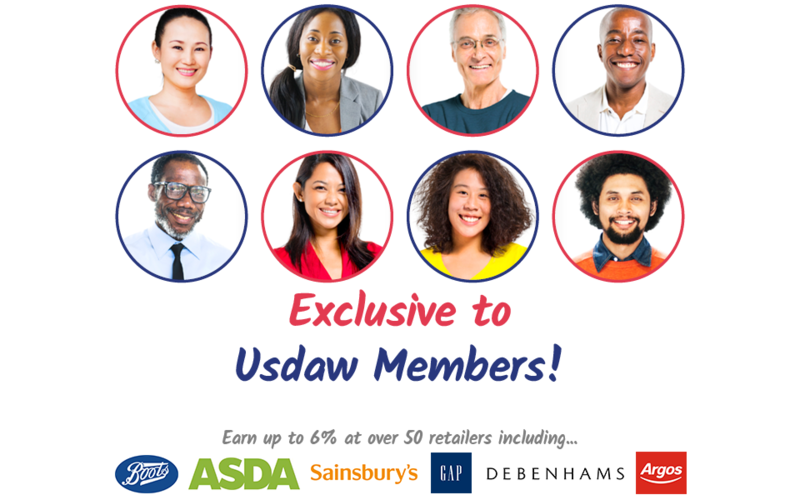 To collect cashback with your Usdaw Prepaid Plus Cashback card, all you have to do is shop at one of our many retailers and restaurants with your card. The cashback that you can earn is unlimited. Using your card at partner retailers will also help cover the £2.95 monthly admin fee. 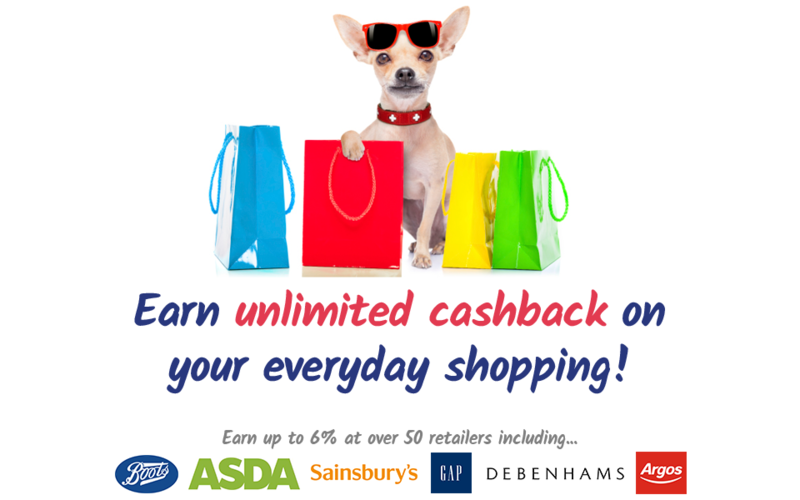 The cashback you earn is added to your Usdaw Prepaid Plus Cashback card each time you top it up. Did you know that the Usdaw Prepaid Plus Cashback card is a great way to manage your money and save on your everyday shopping? Use our cashback calculator below to estimate how much you’re likely to spend by category and get an idea of your average overall monthly outgoings. At the same time you’ll discover how much cash you could be earning back. 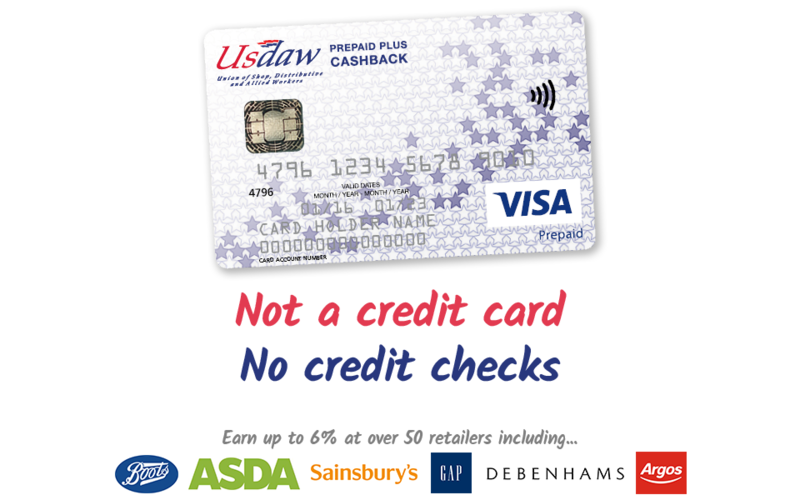 The Usdaw Prepaid Plus Cashback card is accepted at 38 million outlets around the world; wherever you see the Visa logo (please note you cannot used this card to obtain foreign currency or travellers cheques). The Usdaw Prepaid Plus Cashback card has been arranged for you by Usdaw and Usdaw Prepaid Plus. Usdaw Prepaid Plus is a trading name of Union Income Limited ('UI'). UI is registered in England and Wales. No. 06595562. Registered office: 4th Floor, 7/10 Chandos Street, London W1G 9DQ.